The Sovrin Governance Framework is the legal foundation of the Sovrin Network as a global public utility for self-sovereign identity. It is developed by the Sovrin Governance Framework Working Group (SGFWG), currently chaired by Sovrin trustee Drummond Reed. Each new version is approved by the Sovrin Foundation Board of Trustees (BoT) to become the official set of governance documents for the operation of the Sovrin Ledger and the Sovrin Network. The first version, the Sovrin Provisional Trust Framework, was approved by the Sovrin BoT on 28 June 2017 and has been operational since the launch of the Sovrin Provisional Network on 31 July 2017. 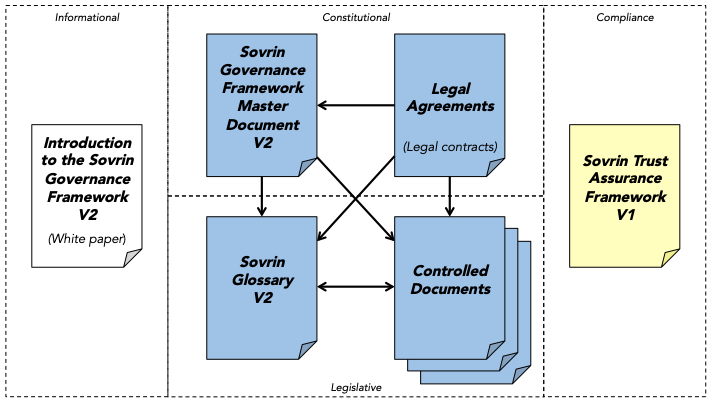 The second version, now called the Sovrin Governance Framework V2, was approved by the Sovrin BoT on 27 March 2019. The Sovrin Governance Framework Master Document (PDF). The “constitution” of the Sovrin Network, this document defines the purpose, core principles, and core policies, and also references all other documents in the SGF V2, including all the Controlled Documents listed in Appendix A. The Sovrin Glossary (Linkable Version). A comprehensive glossary of almost 250 terms used throughout all the SGF V2 documents and all of Sovrin infrastructure, plus eight appendices that provide in-depth explanations of core groups of terms. Also available in a PDF Version. The Sovrin Trust Assurance Framework (PDF) This document defines criteria and processes for assessing conformance of different Sovrin actors to the policies of the Sovrin Governance Framework. The Sovrin Steward Agreement (PDF) between the Sovrin Foundation and a Sovrin steward. The Transaction Author Agreement (PDF) between the Sovrin Foundation and any person or organization initiating a write transaction to the Sovrin Ledger. The Transaction Endorser Agreement (PDF) between the Sovrin Foundation and any organization requiring permissioned write access to the Sovrin Ledger. Sovrin Governing Body Policies (PDF)—the governance policies that apply to all Sovrin Governing Bodies. Sovrin Ledger Access Policies (PDF)—governing reading and writing to the Sovrin Ledger and processing Sovrin Ledger Transaction Data. Sovrin Steward Business Policies (PDF)—governing qualification, application, activation, operation, suspension, and termination of Sovrin stewards. Sovrin Steward Technical Policies (PDF)—governing the security, node operation, node selection, and reporting requirements for Sovrin stewards. Sovrin Economic Policies (PDF)—governing economic incentives, fees, and regulatory compliance. Sovrin Trust Mark Policies (PDF)—governing use of the Sovrin Trust Mark by stewards, agencies, and developers. See Appendix A of the SGF Master Document (PDF) for a list of additional specifications referenced by the SGF. Lastly, the SGFWG is currently developing a white paper, Introduction to the Sovrin Governance Framework V2, that will provide an introductory overview of the SGF and the decentralized trust model enabled by self-sovereign identity. Look for an announcement of this white paper in April 2019. All Sovrin Governance Framework documents are open to public review and comment. Every official approved PDF version above includes a link to a living community version listed at the bottom of this page. These are hosted as Google docs where anyone can add comments or make suggestions. Please be judicious when you post—hundreds of hours have gone into these documents, and all comments or suggestions will be reviewed by SGFWG members, so we appreciate thoughtful and deliberate contributions. Please note that the Sovrin Foundation is a non-profit public trust organization, so any contributions become part of the Sovrin public trust. We are happy to provide acknowledgement of valuable contributions. The SGFWG is always open to new participants. There is no membership requirement other than a genuine interest in decentralized governance for a global public utility for self-sovereign identity. Background in technical, legal, or business policy development is a bonus. Please visit the Sovrin Governance Framework Working Group meeting page or contact us directly if you would like to contribute to this work. All SGF V2 documents are also available for public comment via a Google doc. Just follow any of the links below.